It's Fat Tuesday y'all! Down here in the south it is Mardi Gras, Carnival, and a chance to let the good times roll! I love Mardi Gras - the colors, the beads, the King Cake, the parties! When I went to college in Hattiesburg, Mississippi we actually had a school holiday on Mardi Gras. Down on the Gulf Coast they have huge Mardi Gras parades. But of course, no one comes close to the original Sin City itself - New Orleans! I haven't yet had to chance to make it to New Orleans for Mardi Gras, but one day I will make the trip. Mostly likely sans mes enfants! 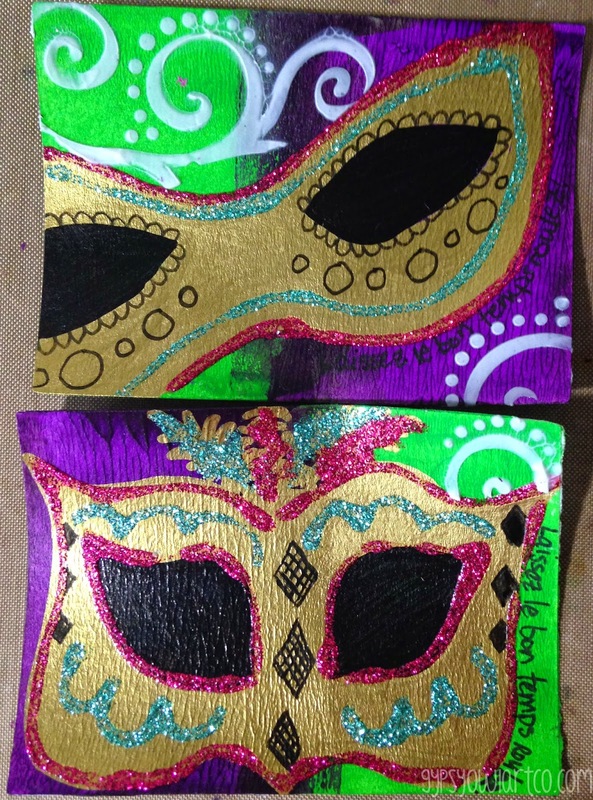 For this ATC Swap, we were charged with creating something Mardi Gras themed. There is nothing so linked with Mardi Gras, both in the past as well as in present as Masks! The cover your face and your identity so you can go around behaving badly and being mischievous without anyone knowing your identity. 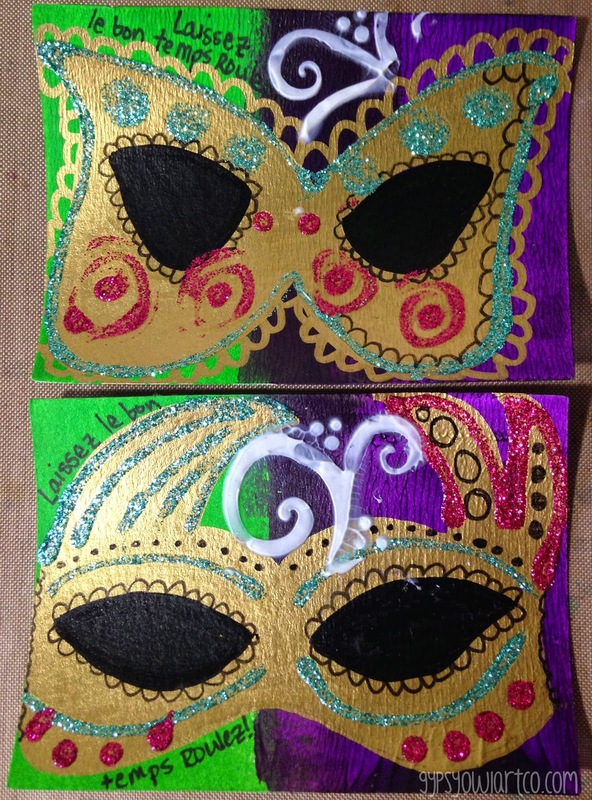 So, I chose Mardi Gras masks for my cards. I started by dabbing a little Prism Violet & Light Green Permanent acrylic and using my trusty brayer. I found a metallic gold Sharpie Paint pen during some rummaging and drew out the masks free hand. 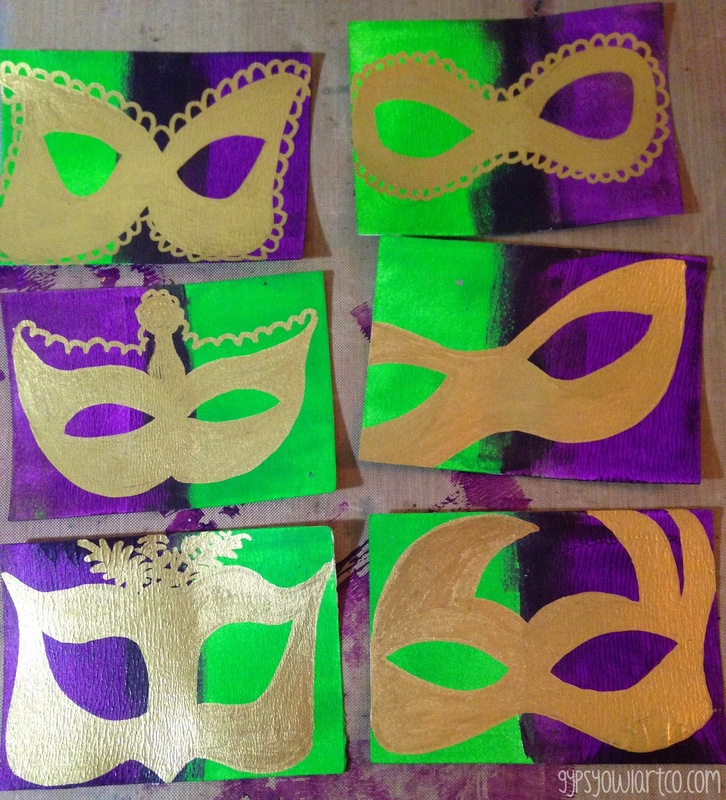 Once my gold paint pen dried, I added doodles and swirls to my masks with glitter glue and a pitt pen. I darkened the eye holes with a black paint pen and added some texture in the background using Golden Molding Paste and a tiny Recollections Stencil. I decided to leave the molding paste white rather than tint it as it gave another contrast to the rest of the ATC. 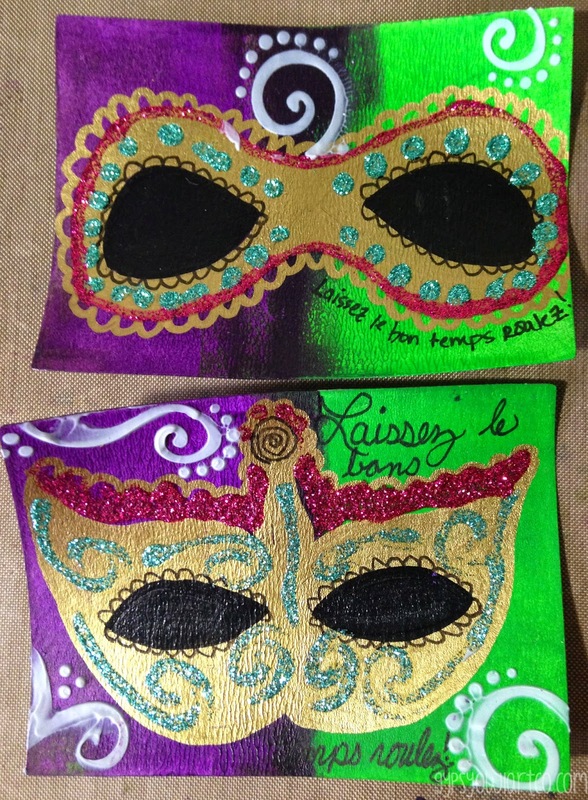 I hand wrote my sentiment "Laissez les bons temps roulez!" (Let the good times roll). All finished! Hope y'all have a great and fun Mardi Gras today! Be safe but have lots of fun!